Notes: Based on the manga by Yabuki Kentarou, which originally ran in Shonen Jump (Japan) from 2000 to 2004. It is being released in North America currently by Viz. Sven Vollfied, a sweeper, is hired to investigate a matter concerning an election and is witness to an assassination by the Chronos corporation. The corporation sent their best man, codename "Black Cat", to do the job, and the assassin finishes the job with cold, calculated ease. However, things are not all well, even in the large and powerful corporation known as Chronos. Black Cat himself eventually deserted the corporation and is joined by Sven in releasing the nano-bioweapon Eve from a black market dealer. With Rinslet completing the group, they travel around working as sweepers. But there are darker shadows in the horizon, and our intrepid gang may find themselves fighting for their lives against supernatural forces who are most interested in Chronos, or, to be more specific, their top ranked assassin, Black Cat. I actually had to try hard to make this anime sound like some cliche'd run-of-the-mill action show, something that certainly isn't the case here. To be blunt, I didn't like the opening episode. With the exception of the assassination, which introduced us to one of our main characters -- a character that may very well sport the dumbest name in the history of anime (with the possible exception of BOBOBO, but that's another story) -- there isn't much I remember from that episode. It turned me off the anime altogether, and it took some convincing from a few of my friends to give this show another go. Maybe it was because the gang wasn't gathered yet that was the cause for my dissent. That, and the show pretty much waited until the next couple of episodes to introduce us to what would eventually lead our group together and start off the main story of the show. Black Cat is a quite nicely animated show. Since there are many battles, often with supernatural powers involved, this is an important issue. Battles flow smoothly, and, despite the crazy mix of powers involved, it is kept at a fairly realistic level. The settings themselves seems to be some odd kind of mishmash between western surroundings coupled with various futuristic elements like huge laboratory setups and the occational computerized add-on. Even one of the main characters is an example of that, but more on this later. Sven Vollfied is maybe one of the most hilarious and charming goofballs I've encountered within this kind of genre. I've heard him described as a mix between Vash the stampede and Spike Spiegel, which might be accurate, I guess. (Having seen neither of the aforementioned shows, I can't confirm that, but it sounds.... well, sound.) At first glance, he seems like quite the harmless guy. He often gets into arguments with the local cafe hostess for never really seeming to be able to pay for the coffee he drinks while he sits there and read whatever newspaper he can get his hands on. When things get serious, however, he's shown as more than able to handle himself. 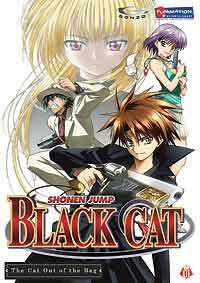 Black Cat is..... he's interesting, I guess, for a character who is named Train Heartnett. There, I said it. TRAIN! HEARTNETT! He is the aforementioned top agent and assassin in Chronos, sporting nearly supernatural abilities at handling his firearms, a simple looking handgun with a "XIII" marking on it. While he isn't the most interesting conversationalist in the group, he never disappoints when it comes to making battle scenes look kickass. (No pun intended.) In the duration of the show, he leaves Chronos at the urges of a young girl, and eventually joins up with Sven and the others after their rescue operation. The... well, the target of said rescue operation is Eve, a nano-machine construct made for battle. When we first meet her (yes, HER), she is held captive by a person who intend to break her -- to prepare her to become the ultimate killing machine, which is made all the more unsettling, seeing as she looks like a young girl. In fact, she reminds me a lot of another young girl in another show I've seen recently; namely Ren from Erementar Gerad, a fact that is made all the more apparent seeing as they're both weapons by nature. Of course, things never go as planned, and inevitably, she meets up with Sven, who promise to take her away and to teach her more about what it is like to lead a human life. It would seem that the last character, Rinslet Walker, is the only one who doesn't seem to be blessed with anything remotely close to supernatural powers. Not that it makes her helpless by any means, though, as she might very well be the Faye Valentine to Sven's Spike/Vash combo. She's sneaky and intelligent, but also fairly able to look after herself when she heads out on her own. Of course, the antagonists seems to be filled with the same kind of strange people that makes up the main team. Ranging from voodoo practicioners to kids on hoverboards a la Back to the future. From bespectabled men in large hats to young schoolgirls with flame attacks. And in the leader's chair, we pretty much have a Sephiroth-type character at his most insane. They've got plans, they've got powers and mr. Sephiroth seems to harbor a rather unsettling interest in our main lead Train. You know, Train Heartnett, our ex-Chronos operative? Yeah, I'm still rather taken aback by that name. Bear with me. Thus far, there has been explosions. There has been large fights and interesting character introductions. This show never sits still for long, because there are always people to rescue or hunt down, always things to figure out and locations to find. And, from what I've seen, there are also change in alliances, which is bound to keep things interesting. Few shows have been so flamboyantly energetic as Black Cat, and for all that I love slower, more reflective shows, I would have to admit that I LIKE this show. A lot! Recommended Audience: There are obviously fairly much violence in this show, though not particularly gory at that. Deaths are portrayed rather realistically, though. The show also has some light fanservice to its name, but nothing particularly heavy (or frequent, for that matter.) As it is, the show is probably fine for most teenagers.